Here is going to be a list of all my products in Second Life which you can buy either in-world or on Apez. Because I'm lazy I have currently only listed just 6 of my products. To view full info for each item just click on the image and you will be taken to the items listing on Apez. 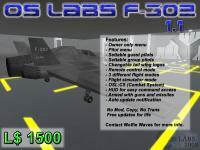 The OS Labs F-302 Intercept Fighter is the first in a new line of Stargate themed vehicles. As seen on Stargate SG-1 and Atlantis the F-302 is a fast, versatile attack fighter. It is mainly used as support craft for the large BC-304 battle cruisers. The Original Stargate DHD, or "OS DHD" as most people call it is the flagship product of OS Labs and also the main reason why OS Labs is named "OS Labs". 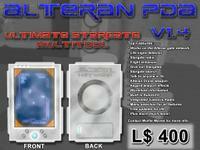 The Alteran PDA is the second most popular item from us. 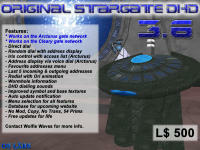 It's a great Stargate themed multi-tool that has loads of features such as an avatar scanner, teleport efects, item rezzer, searches for a gate in your current region, move lock, flight booster and much much more. 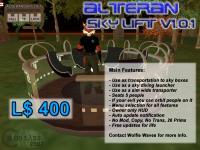 The Alteran Sky Life from OS Labs, the first in a new line of transportation and sports systems based around Stargate and Atlantis styles. This item is great use as a lift for a sky box, transportation to anywhere in a sim (Provided your not banned from a parcel or there is no access list), for use as a sky diving launcher for aerial sports and many other things. 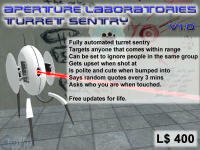 The Aperture Laboratories Turret Sentry as seen on the video game Portal by Valve that is based off of Half Life 2. 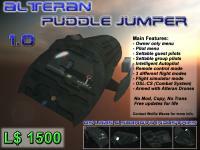 The turret is fully functional and can do everything that the turren in Portal can do.